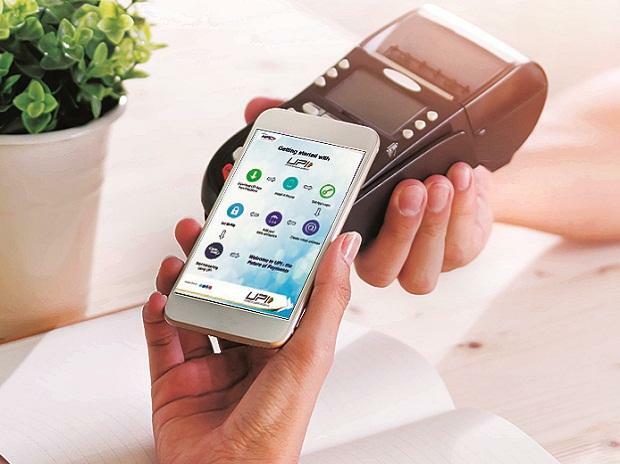 Transactions via the unified payments interface (UPI), the country’s flagship payments platform, crossed a value of Rs 1 trillion in December, according to the data released by the National Payments Corporation of India. 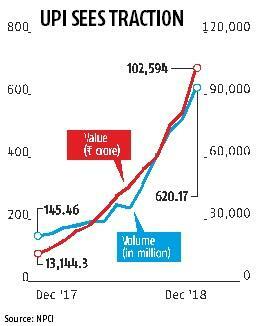 The value of UPI transactions in December stood at Rs 1.02 trillion, against Rs 82,232 crore in November — a rise of 25 per cent. The volume of UPI transactions for December stood at 620 million, a growth of 18 per cent over the previous month. The UPI transaction volume for November stood at 525 million. Mobile wallet transactions for the month of October stood at 368.45 million, with a value of Rs 18,786 crore. This was a rise of 25 per cent and 13.5 per cent, respectively, over the previous month. According to the latest set of data released by the Reserve Bank of India (RBI), card transactions in the month of October saw a rise of 9 per cent in volume to 1.4 trillion and 12 per cent rise in value to over Rs 4 trillion. UPI has seen exponential growth during the year, with volume growing four times and value growing seven times in December 2018 over December 2017. The data for the other modes of transaction is available only till October. The government’s UPI app, Bharat Interface for Money or BHIM, saw transaction volume of 17.35 million and value of Rs 7,981.82 crore in December. BHIM has seen a declining share in UPI transactions, with competition from private players. In addition to local players like Paytm and PhonePe, global players like Amazon Pay, Google Pay, and WhatsApp Pay are also actively pushing UPI through cashbacks. Banks are also trying to increase their share of UPI transactions through various partnerships. A major chunk of UPI transactions currently are peer-to-peer transactions. The launch of UPI 2.0, which targets merchant payments, signals that the platform might see stronger growth. “UPI is cost-efficient and asset-light, compared to other alternatives and, in most cases, it can be activated by the recipient (merchant or business) on a self-serve model. It is indeed a much-needed feature added to a platform,” said Mahesh Makhija, leader-digital & emerging technology, EY India. According to Kalpesh J Mehta, partner, Deloitte India, the biggest disruptor among the new UPI 2.0 features is the one-time mandate feature. “It can make the payment experience much more seamless, and at the same time give greater control to the customer. It can enable multiple use cases, which can help proliferate its adoption,” he added. The RBI has also announced that wallets would soon be interoperable through UPI, which is expected to greatly boost UPI and digital payments as a whole. According to NITI Aayog, India’ payments space has the growth potential of becoming a trillion-dollar industry in next five years.